Born October 15, 1925 in Louisville, Kentucky, Mickey Baker spent his early years in an orphanage and played music in its marching band. At the age of sixteen he ran away from the orphanage, and ended up working in New York City as a laborer. After hearing many of the leading jazz musicians, Mickey fell in love with jazz at the age and decided to buy a guitar at the age of 19. After a few years of study, including time at the New York School of Music, he formed his own jazz band but was not that successful. Looking for a more receptive audience, Mickey moved to California where he heard blues guitarist Pee Wee Creighton play. Creighton's success inspired Baker to change his own style and he returned to New York as a blues guitarist. This move proved profitable as he found himself in demand for the Atlantic, Savoy, and King recording labels as a backing artist for top blues artists including Ray Charles, Big Joe Turner, and lots of others. During the mid 1950s, Baker joined forces with an ex-guitar student by the name of Sylvia who was also a singer. In 1957 they had a hit song called "Love Is Strange." Their popularity lasted through 1961, when they were able to establish their own publishing and recording company as well as their own night club. They were now able to distribute Mickey's guitar method books and record albums worldwide. Still wishing to play jazz guitar again, Mickey Baker and his wife moved to Paris where Mickey has done well for himself writing, arranging, and leading various groups. Contains both Vol 1 & Vol 2 of Mickey's original course under one cover written by one of the most outstanding jazz guitarists of today! This book teaches you everything you need to know to become a confident, accomplished jazz guitarist including: how to play chords the modern way, vamps and fill-ins, bop-blues, bounce blues, runs, introductions, technique, theory, and much more! Complete with easy-to-follow text and self-testing exercises. Mickey also shows you the right way to practice for quick progress! Mickey Baker & Sylvia Play "Bewildered"
Mickey Baker - Legendary Jazz Guitarist & Author! Mickey Baker was born on October 15, 1925 in Louisville, KY. His fame amongst many guitarists is generally as an author of different guitar books and courses. 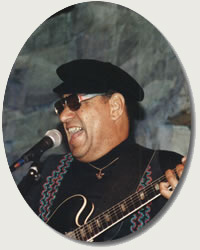 He has actually also been an expert guitar player mainly in the field of rhythm and blues music. He is still musically active and now resides in Paris with his wife Sylvia. As a boy Mickey Baker lived in an orphanage and it was in this institution's marching band that he initially established an interest in music. At sixteen he ran away from the orphanage and ended up in New York city earning his living as a worker. By the time he was nineteen, having paid attention to numerous leading jazz artists including Charlie Parker and Dizzy Gillespie, Baker made up his mind that he wished to be a jazz musician. The trumpet was his first choice however the cash required to acquire this instrument was too much so at the age of nineteen he chose to purchase a guitar instead. After a few years of practicing and studying, including a short spell at The New York School of Music, Mickey Baker decided to form his own jazz group in 1949. While he was attempting to earn the cash needed to get back to New York city, Baker heard blues guitar player Pee Wee Creighton which was to change the outcome of his life forever! Mickey liked the style of guitar playing he heard and saw and that Creighton was also making a good living! The result was that Baker changed his guitar style and went back to New York city as a blues guitar player. His decision showed itself to be a superb one as Mickey Baker, blues guitar player, discovered himself in demand for the Atlantic, Savoy, and King record companies as a backing guitar player for leading blues artists consisting of Ray Charles, Big Joe Turner, Ruth Brown, and The Drifters. Throughout the 1950s Mickey felt he could improve his financial status by emulating the chart topping duo of guitar wizard Les Paul and singer Mary Ford. He decided to join forces with an ex-student of his whose name was Sylvia and in 1957 they had a smash hit with a tune called "Love Is Strange". Their popularity lasted right through to 1961. With this success behind them the Bakers were economically able to create their own publishing and recording businesses in addition to their own night club. Since the early 1950s Mickey Baker had been working on his jazz guitar courses in addition to his record albums and now through his own publishing company he attained international distribution for these works. In spite of his success as a blues and pop guitar player Baker felt that he still desired to play jazz guitar again. He therefore decided to move with his spouse to Europe where he hoped he could develop a more fulfilling musical life. He bought a house in Paris and established permanent French residency there. Ever since that time Mickey Baker has experienced great success by writing, transcribing, and performing with different groups and has to a large degree fulfilled his desire to continue playing his own distinctive style of jazz blues guitar. To this day his now legendary jazz guitar course books are still enthusiastically recommended and utilized throughout the world by lots of guitarists! He died recently on November 7, 2012 at the age of 87.